Meanwhile, Natch has awakened in a windowless prison with nothing but a haze of memory to clue him in as to how he got there. He's still receiving strange hallucinatory messages from Margaret Surina and the nature of reality is buckling all around him. When the smoke clears, Natch must make the ultimate decision -- whether to save a world that has scorned and discarded him, or to save the only person he has ever loved: himself. 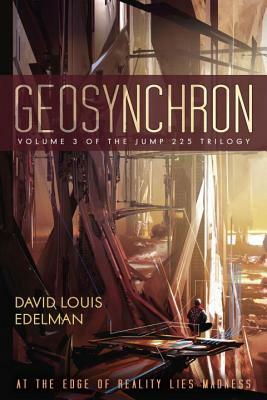 David Louis Edelman is a science fiction novelist, blogger, and web programmer who lives outside of Washington, D.C. He was a finalist for the 2008 John W. Campbell Award for Best New Writer. His first novel, Infoquake, was named by Barnes & Noble's Explorations as their Top SF Novel of 2006 and nominated for the John W. Campbell Memorial Award for Best Novel. In addition to writing novels, Dave has also programmed websites for the U.S. Army, the FBI, and Rolls-Royce; taught software to the U.S. Congress and the World Bank; written articles for The Washington Post and Baltimore Sun; and directed the marketing departments of biometric and e-commerce companies. He is married to Victoria Edelman.